There will be a post-screening Q&A with director Amir Amirani. Premiering to standing ovations at the prestigious Sheffield DocFest, We Are Many was the breakout hit of the festival. 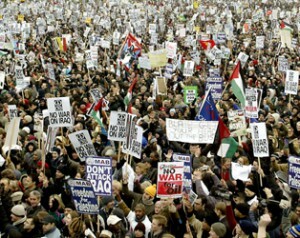 It uses the biggest ever protest mobilisation, the anti-Iraq-War marches of February 2003, as a fulcrum, exploring the legitimacy of that war and also the enduring impact of that protest, from local upheaval to very real changes in Arab countries. This is a personal and political film, told on an epic scale, featuring interviews with Damon Albarn, Jesse Jackson, Richard Branson, Noam Chomsky, Tony Benn, Lindsey German, Medea Benjamin and a fascinatingly candid Hans Blix.